Just so you don't think we're all talk, I thought I would share the resume I made (a while back) that is the impetus for much of my creative resume thinking. Although not quite as bad as the current job market, In early 2003 I was on the job hunt in the midst of a post 9/11 market slowdown. To make myself stand out, I completely rethought what a resume could be. The idea behind my resume came to me in the form of a small Ikea booklet that came in Dwell magazine. 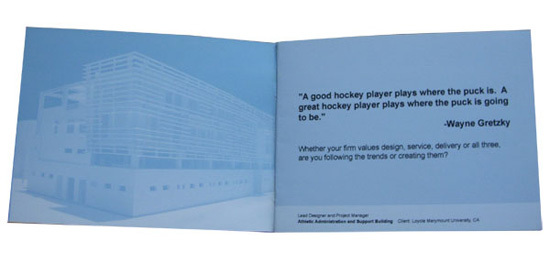 The booklet was just an ad for Ikea, but the format, language and graphics were compelling. I copied this format very closely. My creative resume cover. Simple. No indication it's even a resume. The booklets were cheap to make: 8 1/2" X 11" paper, printed on both sides, cut in half, trimmed for a full bleed look, folded and stapled. Finished size was 3 1/2" X 5". I made them myself on a crappy inkjet printer. The labor took some time, but I was unemployed, so time was a resource of which I had plenty. Let's take a look behind the resume cover. Page 1-2 of the resume. Shows an image of my work. 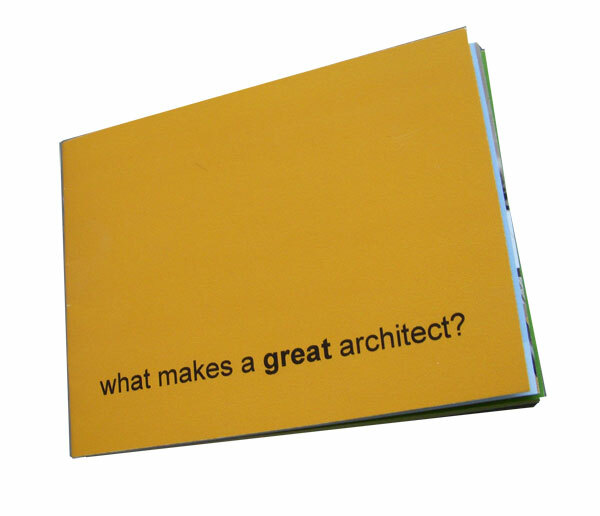 The short (easy to read) text is about my philosophy as an architect. After three more page spreads similar to page 1-2 above, I had a customized cover letter addressed to someone in the firm. In the short letter, I requested an informal interview to learn more about the firm. Following the cover letter is the start of the detailed portion of my resume. It contained my contact info, a picture for some personalization, as well as personal and educational information. The last pages of the resume contained what I call the "boring" part of the resume. A list of places I worked, projects I worked on and professional skills. This traditional resume info was here as an index in case anyone wanted details. I mailed the small booklets in appropriately sized envelopes and hand addressed them using an old lettering stencil. The idea was that they wouldn't look like a resume, but like an invitation. This would improve my chances of having someone actually read it. Even in a tough market I got a lot of interviews with this resume. And after I landed a position, I received calls years later from firms that held that resume. In fact, my next job, two years later, was from one such firm. Look for inspiration for your resume. Company websites and magazine ads are great places to start looking for creative ways to market yourself. Bookmark the link to Rethink Your Resume so you can come back and measure your results. Give us some feedback via the form to the right or by commenting on the blog article. Check out some other Modative resources. Learn more about the Rethink Your Resume Author. Be sure to check out "Rethink Your Resume", the philosophy behind this creative resume.